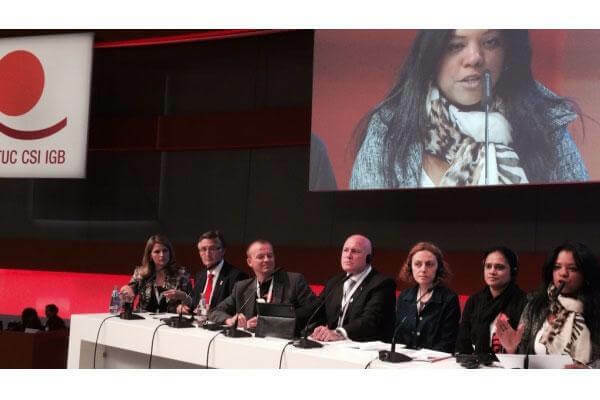 The ITF shared the lessons of the DHL campaign at the ITUC (International Trade Union Confederation) congress in Berlin, Germany this week – and took away lessons from the world’s trade unions. Acting general secretary Steve Cotton told the 1,500 delegates: “I want to pay tribute to TUMTIS, a union with a flair for organising, true grit and determination. Its vision was to unionise Turkey’s logistics sector, and it went on to win that battle. The ITF’s message was strongly supported by Goknur Mars of TUMTIS, who powerfully conveyed the workers’ experience of nearly 500 days on the picket line. She movingly told the audience how at DHL Supply Chain Turkey the other workers were working for low pay for long hours – often sleeping at the warehouse. When they decided to join TUMTIS they were sacked, and workers were intimidated and pushed towards a different union. But, she explained, the international support from trade unionists worldwide helped them put pressure on the company until TUMTIS triumphed. The ITUC congress runs from 18 to 23 May, and has brought together trade unionists from around the world to share their experiences, build links and plan for the future. To see photos from the ITUC congress visit. One of the lead topics at the congress was realising rights, with a special focus on the labour abuses in Qatar that make it such an unfitting host nation for the World Cup. The ITF’s campaign on exposing the conditions at Qatar Airways was highlighted, and the airline’s CEO Akbar Al-Bakr was only cheated of being voted the world’s worst boss by 2.2 percentage points. Out of nine possible candiates in the contest, he finishing a whisker behind Amazon’s CEO in the vote. Al-Bakr garnered 20.5 per cent of all votes cast, to the “winner’s” 22.7, and pushed Rupert Murdoch into third place. During a debate on sustainable jobs, ITF president Paddy Crumlin spoke on workers’ capital, and making pension funds work for workers. Austerity doesn’t work, he told the meeting – consumption drives the world and can deliver jobs. The ITF is already connecting worker supply chain power, he explained, linking transport with retail, manufacturing and mining. By combining resources, he said, the ITF, global union federations and the ITUC can deliver not-for-profit pensions that benefit workers. The ITF’s Jodi Evans joined Mick Doleman of the MUA (Maritime Union of Australia) in a debate on how unions can tackle violence against women. The ITF’s Action guide on violence against women was shared as a campaign tool all unions can use. As with the ITUC event, the ITF’s forthcoming congress will also be paper-free and use digital technology to make it the most inclusive ITF congress ever – including for those who can’t make it to the event itself.